I certainly have mixed emotions but I guess if pressed , Pete Rose was a featured player on a featured team from the 1970’s and I will never believe he would have thrown a game.. I also don’t think the gambling subculture from the 1960’s/70’s can be ignored and affected legends like Paul Hornung , Willie Mays, Mickey Mantle, and many others. I wonder if it’s going to be full rehabilitation or just forgiveness. But what were the rest of you distracted by? Pete has done his penance and shown contrition. 20 years is long enough. He deserves the opportunity not just to be eligible, but to know if he eventually is admitted to the Hall. I wouldn’t want you to take this the wrong way Keith, but I sure wish I was there with you. I can’t think of any place in the world I would rather be than in the basement of the Baseball Hall of Fame. Wow. What a difference a few days makes. When I thought you would perhaps do an article on who you thought had been overlooked for the HOF, I assumed you would mention Smokey Joe Wood or Roger Maris or Shoeless Joe Jackson or any number of players. Never in a million years did I think it would be Pete Rose. There sure have been some interesting and rather quick developments this weekend on this front. This is a big story up here in MA with the sports writers. I wouldn’t be disappointed if Pete Rose got in. As most people have been saying, he will be judged on his years as a player, not as a manager. And in the final analysis, let’s face it – museums were built because of players like Rose. The Big Red Machine – who could ever forget them? What a great vacation you must be having. Hopefully your Countdown fans will get a peek at some more baseball memorabilia you have uncovered, once you return back to work. It has been fascinating these last few days being able to come here, read your articles and then walk through baseball’s last 100 years through your photos. Glad you’re enjoying your vacation, can’t wait for you to return to Countdown! Go CUBS! 101 years – a proud losing tradition. I would certainly think that Barry Larkin is a lock to be voted in next year without any controversy. Thanks for a great report on the hall and in particular a nice shot of the lake. I remember skipping rocks onto that lake during my one and, thus far, only trip to Cooperstown. I was eight years old and spent the weekend there with my Dad, away from Mom and Sister, just the boys having a good time. We walked from the hall to the lake and watched the sun go down. It was a great weekend and I remember it vividly. I can’t wait to take my kids there one day. It sounds like you are having a great vacation. I would have enjoyed finding the Casey Stengel scorecard as much as you did. I really miss you on Countdown, so much that I came looking for you here! Your guest hosts haven’t done a bad job, but I really miss your commentary, and there is so much I would like to hear you discuss. Hurry back to the Countdown. Your neice is so cute! I’ve missed you so much on Countdown, I came looking for you here. It sounds like you are having a great time and that scorecard find would have thrilled me, too. But I have to say, even though they do a good job, Countdown just isn’t the same without you. Please hurry back, there are a bunch of things for you to comment on. Having grown up around and boated on NY Lakes, they are beautiful. Thanks for the picture. Can I come and play? I will not weigh in on Pete. Time makes us sentimental and this occurred before the other scandals and strike. However, as a Yankee fan, watching the Phillies play the Cardinals on Sunday, I was alternating between watching the game, which was great, and the scoreboards to see how NYY, Boston and Tampa Bay were faring. The person asked me a trivia question which I could not answer fully. So, I am passing it on to you an yours. What are the nine ways a batter can get to first base without a hit? I made it to five. How about the rest of you. Loved ready Connie Mack’s comments. Hey Keith, nice to know that you are enjoying your vacation, … discovered this morning while browsing thru HuffPo. I had thought you were in Argentina or hiking the Appalachian trails. Come back soon, Keith. We miss you. It’s been hell at 7p and 9p (Chicago time) without you on Countdown. By the way, Lawrence O’Donnell was dynamite yesterday. He’s been your best guest host ever. The man is intense and full of passion. Like you did for Rachel, you gotta to put in a good word for him to get his own show. Those overpaid knuckle-heads at MSNBC headquarters listen to you, don’t they? Forgive me for sounding like a moron, but why isn’t Roger Maris in the Hall of Fame? Good grief, if that happened, my Dad would plotz all over himself & be making a pilgrimage to Cooperstown. Let’s look at it in judicial terms, Rose’s 20 year sentence is up. Why is’nt Maris in the Hall? He was a curmudgeon not beloved of the baseball writers of the time and he had the temerity to be the first to break Babe Ruth’s home run record. I hope it was more for the first reason than the second because the illogic of the latter beggers belief. We loved him in St. Louis. Keith, my tongue is dragging from envy. And I’m a historian, so I frequent libraries. That’s one I haven’t been able to visit, and I have GOT to find a way and an excuse. As to Pete Rose, Jon Miller made a comment years ago that struck me as showing some influence by Joe Morgan. Miller (And while I am here, why isn’t he getting considered for the Ford Frick Award? He has broadcast major league baseball for 30 years and is great at it) said he thought it was silly not to have Pete in the Hall, that it reminded him of communist leaders erased from photos–Mao is there one year and gone the next (I think the commies invented photoshop). To Miller, that’s what it’s like to keep Rose out of the Hall–he is the all-time hit leader and, lest we forget, he did it from five different fielding positions. But, Miller said–and I am certain he picked this up from his relationship with Morgan–his impression was that if Rose went in, other Hall of Famers would refuse to attend because he violated THE rule. Now, though, Rose is looking a little less dubious in retrospect because no one would ever question his commitment to winning, and that he did it without steroids. As to your hopes for elections, I am with you. Like you, I bow low at the mention of Vin Scully, and he has pushed for Gil Hodges for years. Let’s bear in mind that Hodges was a superb hitter and fielder, and happened to manage the 1969 Mets to a World Series victory–which, to invoke another wonderful announcer named Lindsey Nelson’s great line, appears on the alphabetical list of miracles right after Lourdes. You mentioned Andre Dawson, who was a tremendous all-around ballplayer with deserving numbers. I share the sadness that is camouflaged between the lines of your blog. It has been my sense for at least the past decade that keeping “Mr. Hustle” from the Hall is, an unmitigated baseball tragedy. Keith, I share the sadness that is camouflaged between the lines of your blog. It has been my sense for at least the past decade that keeping “Mr. Hustle” from the Hall is, an unmitigated baseball tragedy. Pete Rose desrerves re-instatement. I’m not saying he should manage again, or even be employed by M.L.B. again. On the merits he deserves to be in the Hall of Fame, considering the notorious, and colorful aspects of some of the inductees Pete fits right in. He has served his time literally and figuratively. In England twenty years constitutes a life sentence. Maybe Pete has learned to keep his mouth shut, and maybe the hall of Fame needs him. Either way is ok by me. With all the doubt about today’s perfomance enhancing boys, gambling doesn’t seem so offensive. I mean we don’t know about Bonds or Clemmons, or Giambi, but there’s no dobut Pete got those hits! I would love to be able to spend a week in the “vault”. Enjoy your week off. Wow, that lake is gorgeous. But the basement……man, the BASEMENT of the Hall of Fame. Did it smell the way I imagine it does, like mothballs and really old leather? I’m from Albany (which is about 30 miles) and I love Cooperstown! I love the scenery with lake and the mountains in the background. 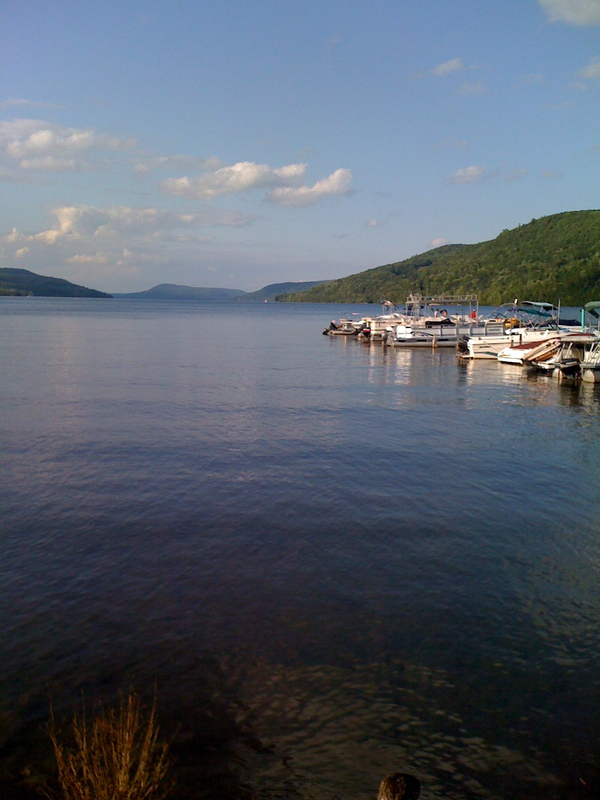 Keith, should know this since you went to Cornell that The Finger Lakes Region Rules!! Time makes us sentimental and this occurred before the other scandals and strike. Best quote about this yet. Please let us not let time make his crime seem any less. It is THE cardinal sin in baseball. He has NOT shown any real regret nor done any real penance. Let him rot outside the Hall forever. He does not deserve to be there due to the consequences of his own behavior. As for those who float the balloon that “he only bet on his own team to win”, tell me how many bullpen arms were abused and overworked to hold on to a win Pete had 100K riding on? How many players that needed a breather found themselves playing all 9 or 12 or however many innings? How did the manager negatively effect his own team in a quest to win that ONE game? 162 games is a long haul and overuse has a deleterious cumulative impact over the course of that season. So don’t tell me about how he “only bet on his own team to win”. That dog won’t hunt. We can dissect which games Rose bet on, what it means, what rules it broke, why else it was bad, etc etc ad nauseum. All of it is irrelevant as regards the HoF. The Hall is for the standout players of the game. On that basis if Pete Rose doesn’t belong there, then nobody does. Pick a game –any game– off today’s schedule and watch a runner going into a close play at second. Now watch the same play from 50 years ago and notice the difference in the slide. That’s one way Rose singlehandedly changed the game. When he came up in 1963 and started that head-first sliding, everybody thought he was insane; then it became his signature; then it became the norm. THAT is impact. And that is what the HoF is made of. To deny Pete Rose’s accomplishments- which is what this silly ban does- is to deny history. By doing so the Game ignores rather than sanitizes its own accomplishments and in effect lives a lie. All this pretentiousness about ethics and gambling and lying and egomania has less to do with ethics, more to do with PR posturing and nothing to do with the playing of the Game. It’s all well and good if your purpose is to slam the barn door after the horse is gone, but this horse left long ago- and it started running, took the extra base and slid in mane-first. If we’re going to make Mr. Congeniality part of the standards, we have a lot of weeding to do, starting with Ty Cobb. I’d rather have a HoF that means what it says it means. The Finger Lakes region is indeed beaultiful, Keith, and I hope you were able to dine at the Blue Mingo while in Cooperstown as well. If not, it’s something for next time–maybe I’ll see you at Cooperstown’s finest restaurant, and the one with the best view of Otsego Lake, the summer they induct Craig Biggio. . . . The Stengel score card is AMAZING. 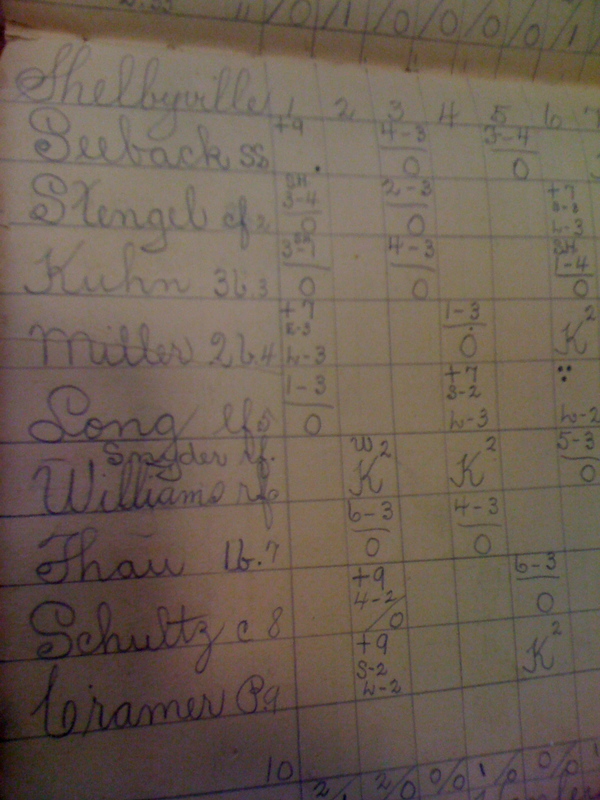 Not only do we see a firsthand account of Casey in the minors, if a time at such great remove from the present can actually be imagined, but we also see that a method of keeping score basically similar to way we do it today was in use everywhere by *1910*. Sometimes it seems as if baseball in all its little perfections didn’t really evolve at all, but rather emerged fully formed from the forehead of Zeus’ athletic avatar . . .